I’m taking a break here in the series on editing. I have a few interviews outstanding, but they aren’t here as yet. Also, I will be doing a set of interviews with authors who use beta readers. It will be interesting to the different point of views. 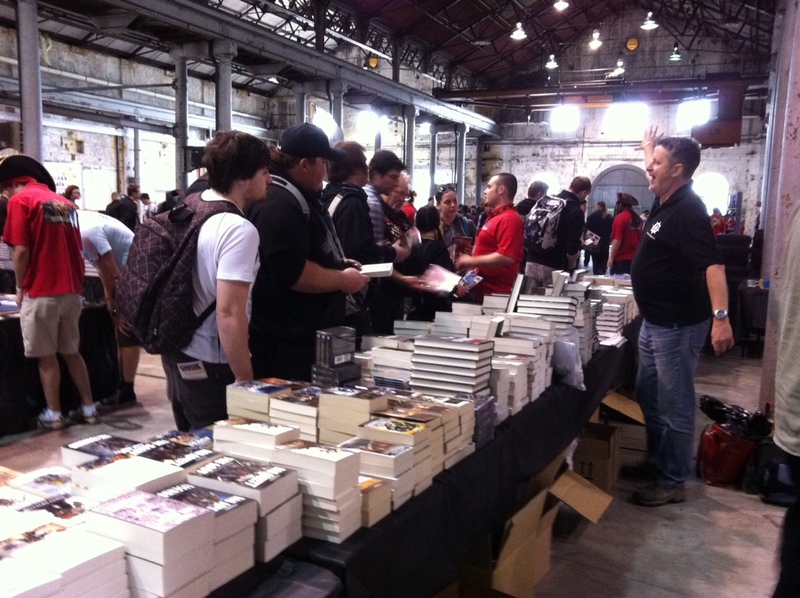 On the October long weekend, Matthew Farrer and I went up to Sydney for Games Day Australia, which is like a convention but more like a trade show for Games Workshop. For those of you who do not know, these are the shops that sell the miniatures for Warhammer and Warhammer 40K, among other things. 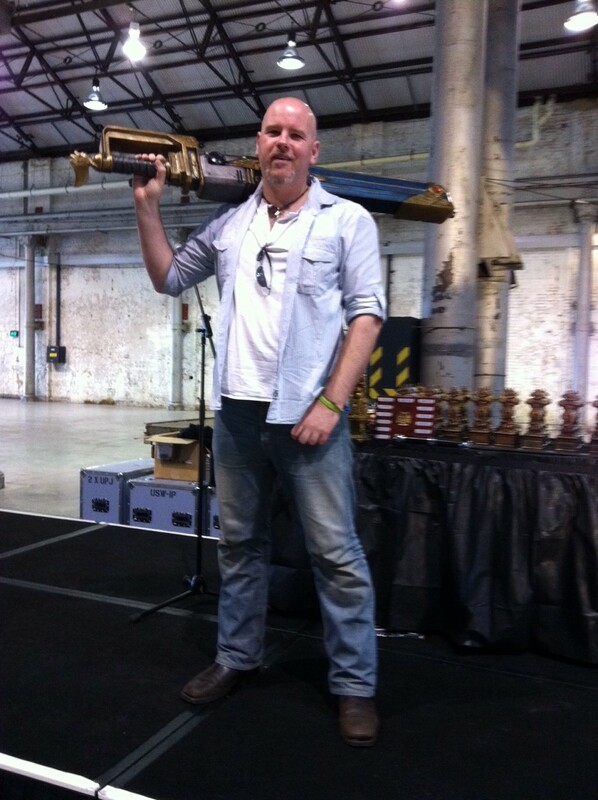 To put you in the picture, Matthew writes for Warhammer 40K on occasion, so he was appearing there to sign books. His blog is here. Games Workshop have a publishing arm called Black Library. See their website for more about them. Here. 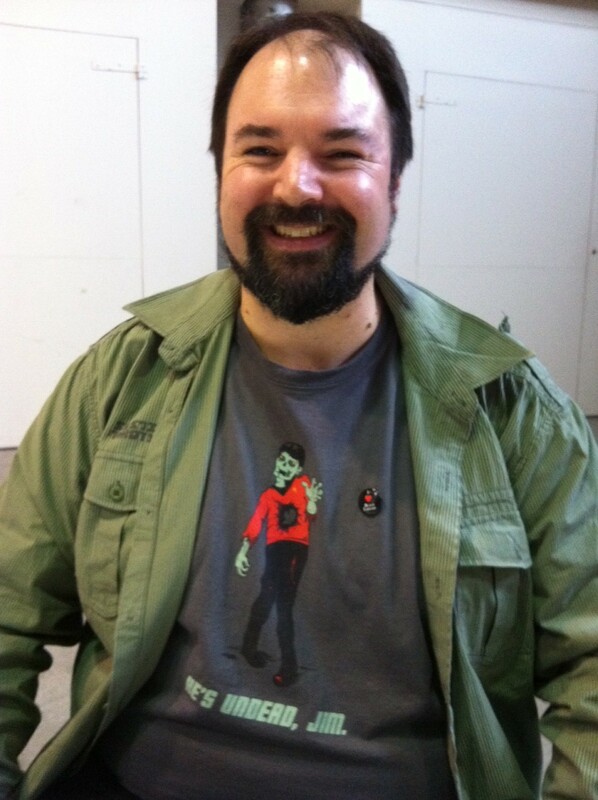 As part of Games Day, Graham McNeill had been dispatched from the UK to make an appearance here. 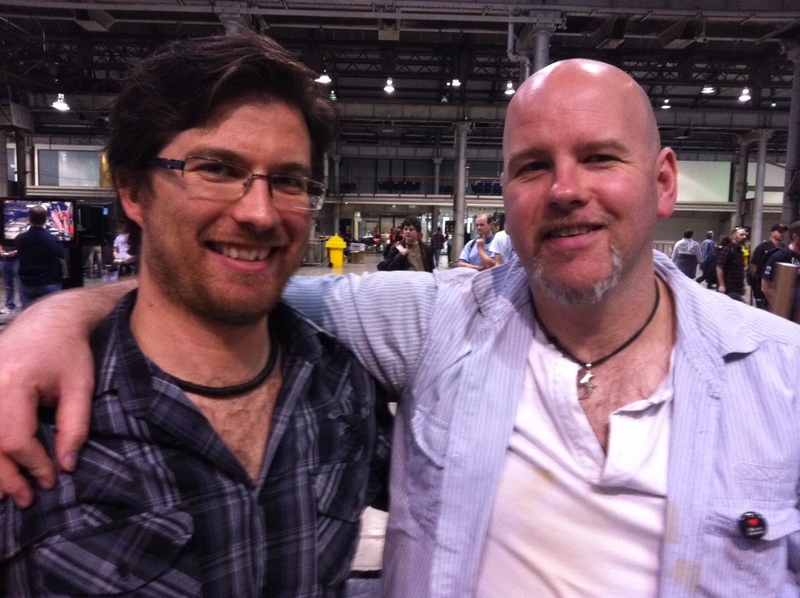 Graham McNeill is one of their big authors, being a multiple New York Times best seller and he won the inaugural David Gemmell award. Here. Graham has a website too. Here. We actually had two conventions to go to, because Conflux 7, science fiction convention, was on in Canberra too. We arrived in Sydney on Friday night, hopefully in time to have dinner with Graham and Anthony Reynolds, another Black Library author. 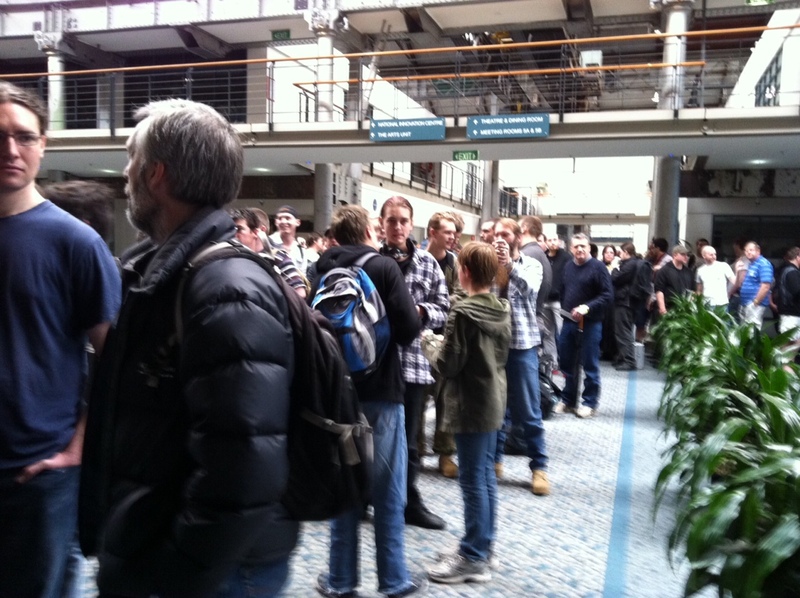 However, Graham had a meet and greet at the City Games Workshop and by the time we got there it was still going on. I mean there was a queue which didn’t seem to get any smaller. There were a whole bunch of people from the UK. Mal Green, who I had met at the Games Day UK 2010, but others who I didn’t know as well as local crew. So it was up to us to make small talk, while we waited for Graham to wade his way through the field of adoring fans (okay maybe it wasn’t like adoring fans) and finish up. It was pretty late actually by the time he did finish up. So about 15 of us trotted down to China Town, looking for a restaurant that was still open for serving food. We found one and piled in. Now I sat next to Alan, who I’d been told was part of the executive from the UK and Matthew. Phill Kelly and his wife were on the other side of Alan. (I tell you about Alan later). It was a big round table and every one was pretty hungry and most of us went for this mega banquet menu. The fare was okay, a bit on the ordinary side, but you know when you are hungry as long as it is fresh and good, you eat it. 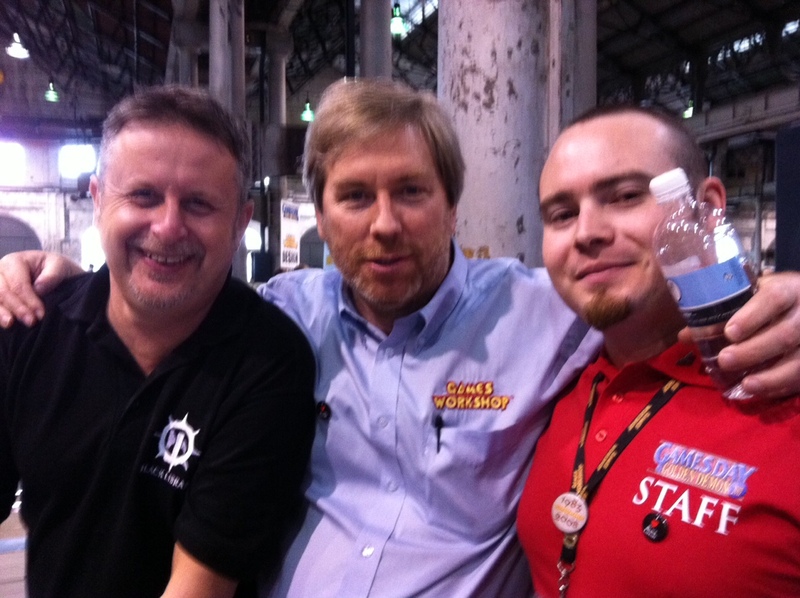 I talked to Alan about Games Workshop. He told me he had been with the company from almost the beginning. Not the beginning but not long after. He told me a bit about the business. Firstly he said there were three aspects to it, the collector, the hobbyist and the gamer. The collect likes the miniatures for collecting, as works of art etc. 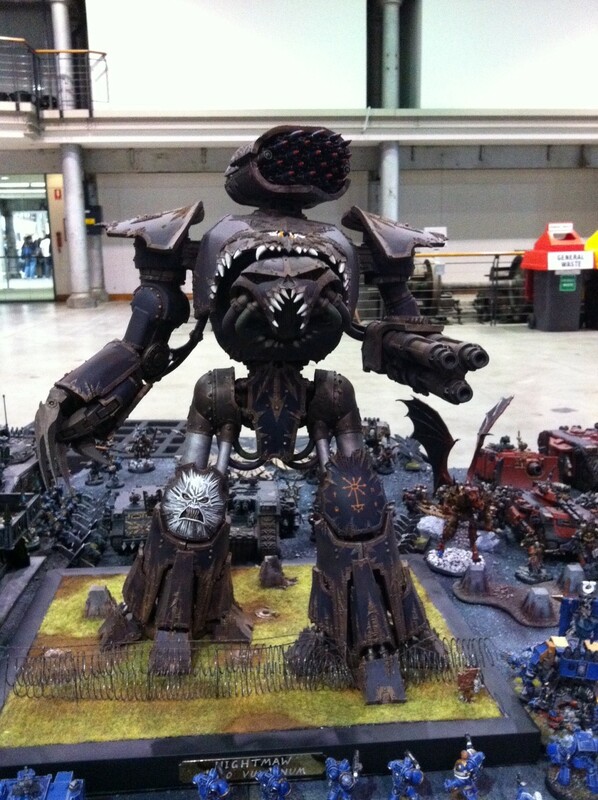 The hobbyist likes to assemble them, paint them etc and the gamers like to play the battles. This is a very simple explanation and with me putting it in to my own words. Alan was a bit more erudite than that. However, he did say that Games Workshop makes people happy and he liked that what he did made people happy and made a profit. So after dinner a few of us went looking for a bar. Alan, Mal, Matthew, Graham and me. (forgive me if I left anyone out). Actually it was a bit hard to find a bar/pub at that time. We settled with our drinks and got onto the topic of sport. Anyone who knows me will understand that this is bizarre because I don’t like sport, watching it, playing it etc. Matthew and I sort of said well the only sport we like is Roller Derby and then the conversation took off. I asked Alan about the different codes and over a drink until about 2.00am he regaled me with the history of Rugby Union, Rugby League and Football (Soccer). It was fascinating. So on to Games Day. 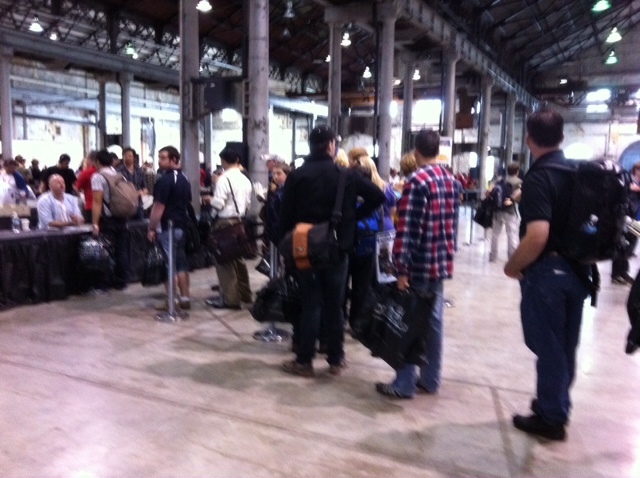 We took a train from Central to Redfern to the Tech Expo, which happens to be the old Redfern Railway workshops. I was fascinated again (I did get fascinated quite a bit). These old buildings were strong in my memory. I recall when I was young taking the long train ride in from Rockdale to the city. By the time, we got near Redfern I was bored and my imagination took hold. I’d see these dark gloomy buildings with a small window near the gable, with something that looked like white paint spilling out of it. The sight always reminded me of blood and monsters, so I was…happy to finally see inside these buildings. The whole estate has been gentrified and bits of machine parts, rail carriages decorate the expo area. 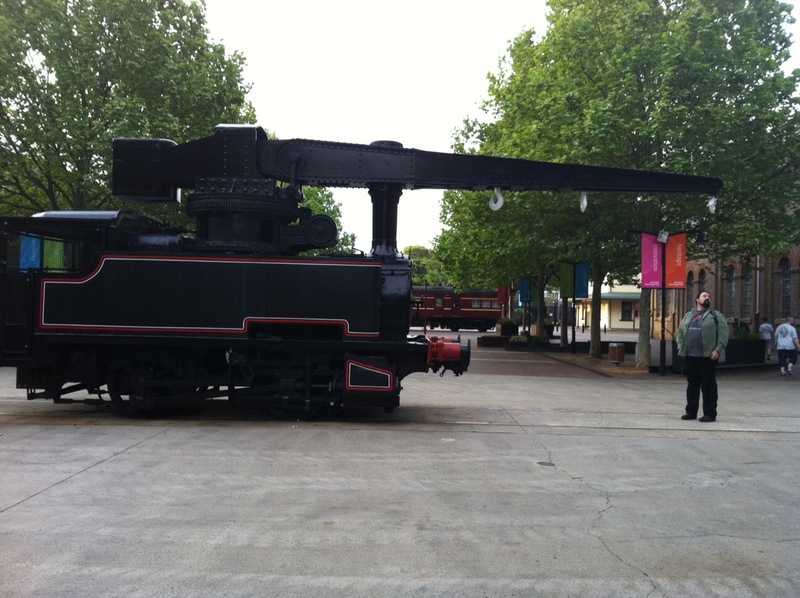 There was one machine that looked like a steam driven engine with a hook on the end. It was probably used to haul machinery but I thought it looked like the perfect Dweeb catching machine. (Matthew is the Dweeb). Here is a photo of the Dweeb, not quite being caught. The next photo is a shot of the inside. This venue was great. 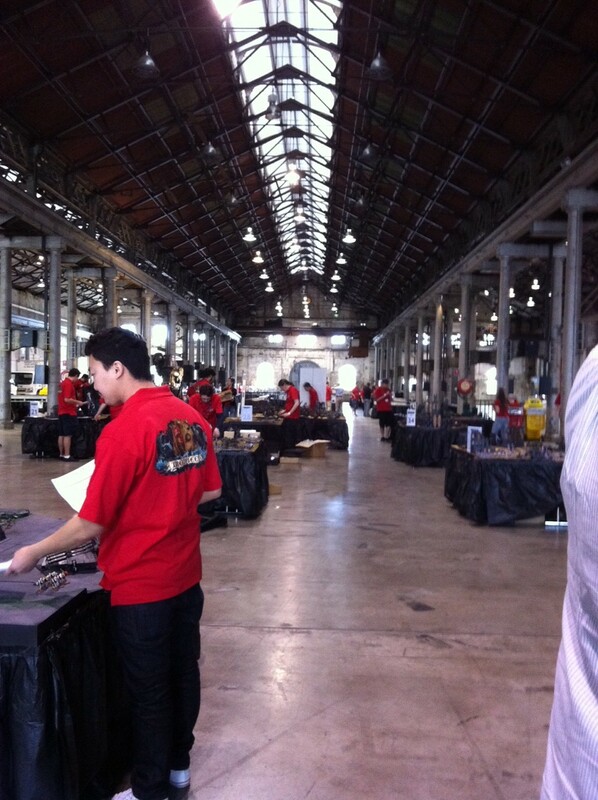 It was an old industrial Victorian Era building, so a wonderful setting for Games Day Oz.Very gothic I should add. Diorama after diaroma lined the room, waiting for the players to arrive. A man dressed as a pirate urged the workers on and revved them up, while the fans waited in long queues outside. 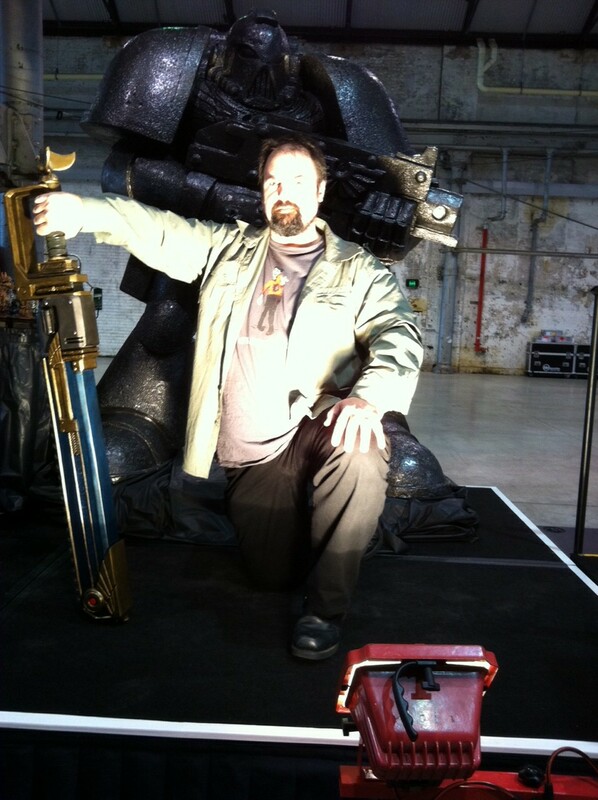 On the centre stage was a model of a two meter tall Space Marine, with a chainsword replica at its feet. The Chainsword was going off as a prize, so the boys thought they’d play with it. Lucky for me I got a couple of shots. This one is of Graham McNeill. Sorry about the light on the face on that one, but it couldn’t be helped. So while things were being set up, Matthew and I went in search of bacon. The UK lot had told us the venue had these amazing bacon sandwiches. However, we couldn’t find any. Here is a picture of Matthew without bacon. He is smiling because I made him. Okay. He hates his photo being taken so you owe this great shot to me and my powers of persuasion. We had to settle for coffee. 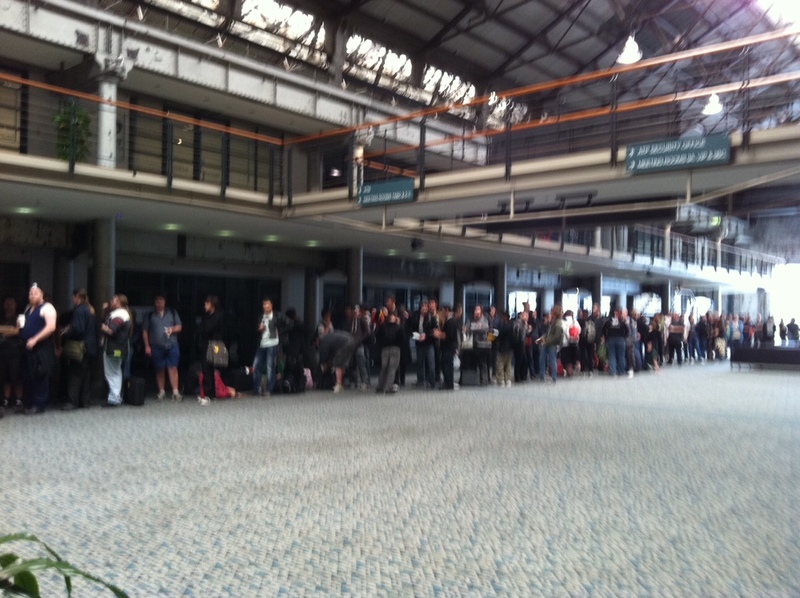 So while we went in search of food, we managed to get a glimpse of the queue outside. I wonder if I can get them to line up. Okay you got me. I’m a dweeb. A geek. And I love this machine! Well miniature of a machine. So the doors opened after this amazing pirate countdown. My heart raced. I felt all this tension and tears came into my eyes. It was so amazing. (I have been to Games Day UK last year but I missed the opening). What a buzz! 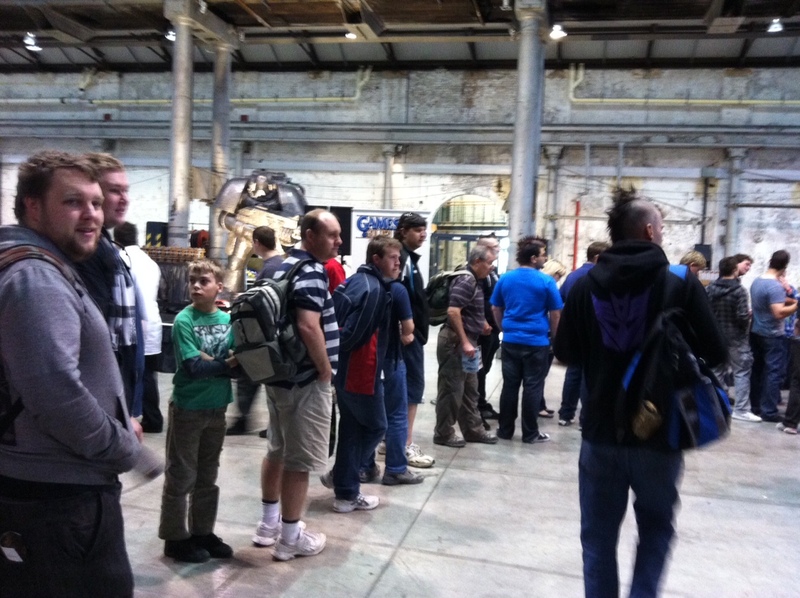 Soon after ( I mean minutes) there was a queue forming for the Forge World kits and one for Graham. I took a shot of this because you know these guys had been queuing outside to queue inside. They are very dedicated. Mal mentioned that they were a bit short handed because a new game was launching and all the stores needed to be staffed. I was there, you know, looking bored (I mean beautiful and dweebie) and I thought I may as well lend a hand. Matthew was to sign books. Mal and Josh were the main guys on the book stall. 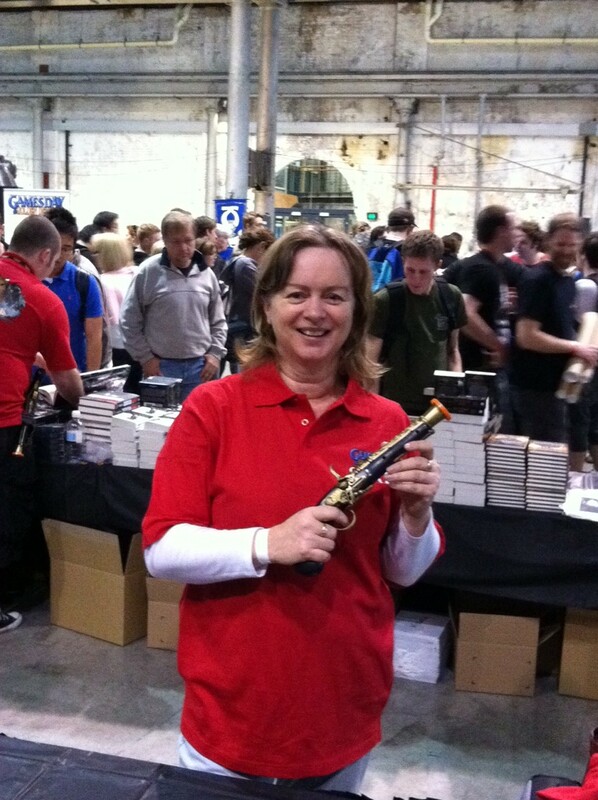 Then I helped and snaffled a staff t-shirt and a mock flintlock pistol. This was another thing that amazes me. I’ve done SF conventions for years now and I’ve never seen books fly off the table as fast as these ones, nor have I seen so many books sell. The fans are very loyal. They did have the added incentive of Graham McNeill there to sign books. 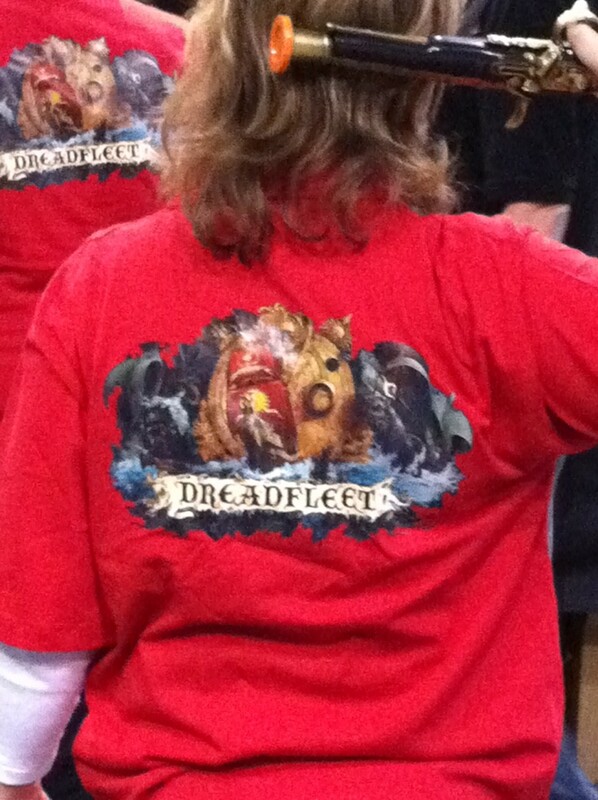 Here is the back view with the lovely graphic of Dreadfleet. The photos of me were taken by James Sweeting. Thanks James. 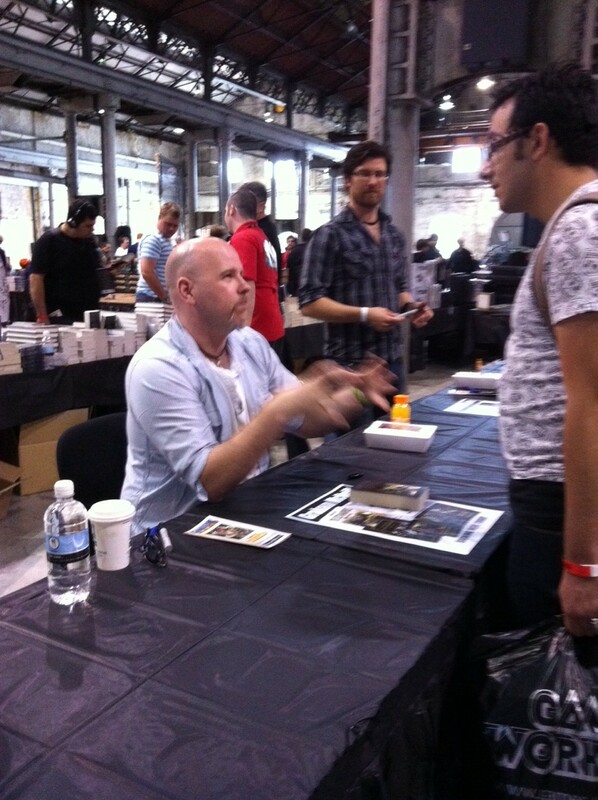 Then there was Graham signing books. Graham had a queue too. I have to say these Black Library authors sign books–all day. 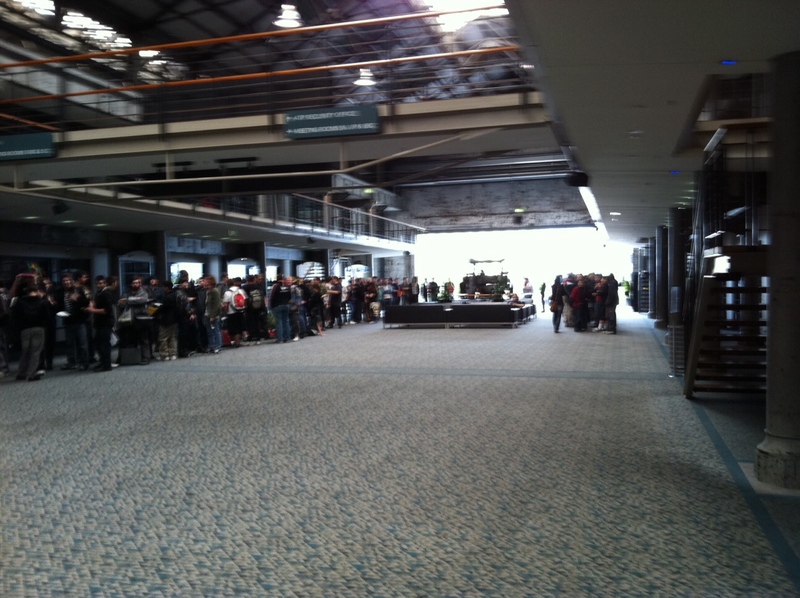 Not an hour or two but the whole day, with little treks to the seminar room to go on panels or Q&A sessions. Graham worked right through lunch. Mal leaves me to do some table minding with the amazing Josh (manager from Cairns’ store) and he tells me sometime during the morning that this really famous guy, Alan Merettt is coming to sign books at 12.00. I’m like wow. This guy must be special. I keep my eye out for this Alan guy. Then comes 12 and Alan sits down. I’m like oh that Alan. The Games Workshop guys tell me that seeing him is something very special. I’m like, I’m sorry I didn’t know. I didn’t quite fall to my knees and say I’m not worthy. I hope Alan realises I know nothing. He treated me very nicely. I have a nice shot of Mal, Alan and Josh. “Oh” says I, feeling a little more silly than before. Matthew bought a copy of Dreadfleet as part of his Games Day haul. Speaking of things fanish. 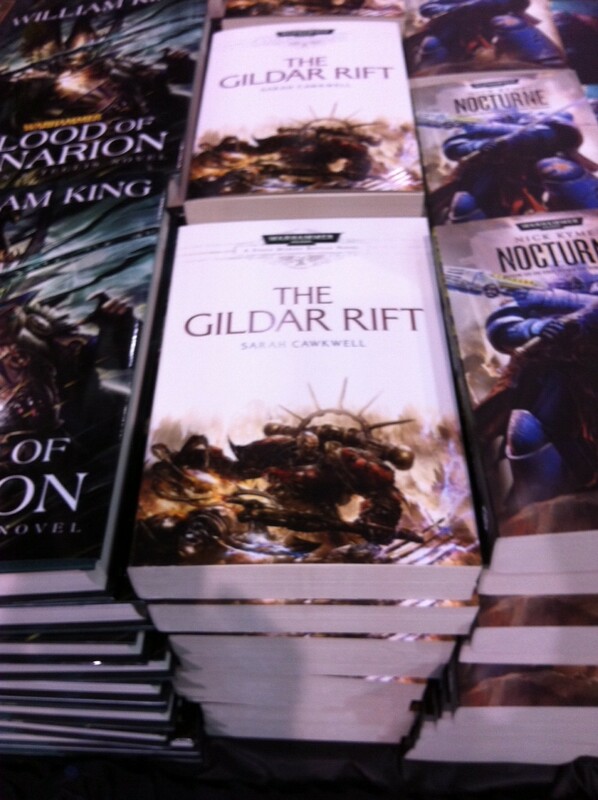 I captured a shot of The Gildar Rift by Sarah Cawkwell, which was on pre-release. She is the first female novel author for Black Library. There are other female writers but I believe they have written shorts stories. I bought a copy and am currently reading it. Go Sarah! After the day progressed, I happened to turn around and look at Matthew. He had a queue. 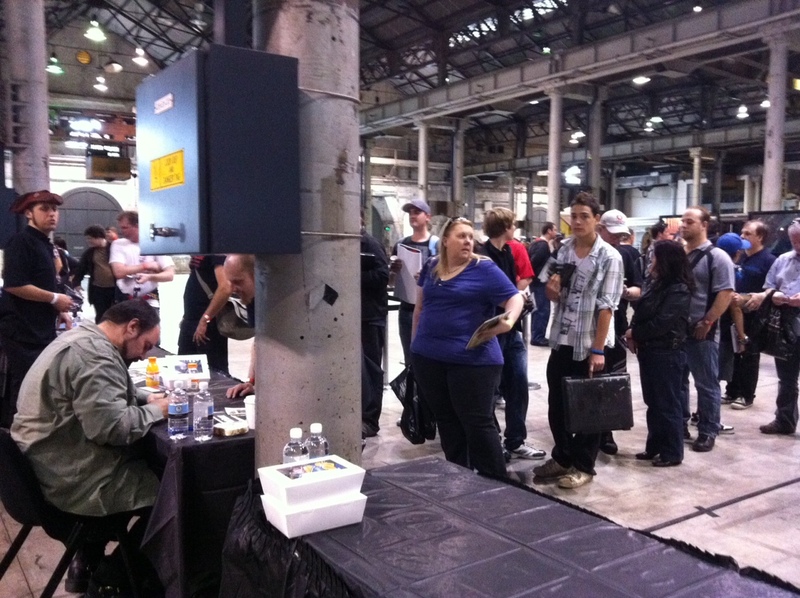 Don’t get me wrong people line up to get Matthew to sign books, but a queue, a long queue. Well I’d not seen that before. So we’ve been selling books and posters. I was the poster lady. I bought one myself! Then it became afternoon. Graham finished signing so I was able to grab a shot of him and Anthony Reynolds. You might notice the huge coffee stain. Apparently someone bumped into Graham when he was finishing up a seminar and spilt coffee all over him. He didn’t have a change of clothes with him and had to sign most of the day in a wet t-shirt. So my final shot is Josh (I pray I have his name right because I’m terrible with names) with a parrot. 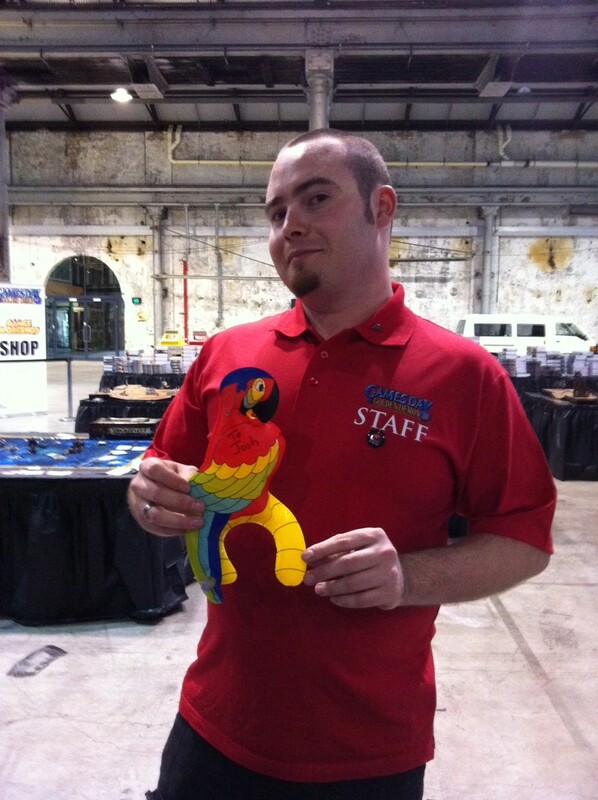 I didn’t quite get the significance of the parrot but I believe Mal gave it to him.Josh was a great guy. I had fun working with him. He is such a dedicated Games Workshop employee and fan, he has a maw tattooed on his navel. I can’t quite remember the significance of the maw. I’m sure someone will tell me. I think it has something to do with orks. I believe Josh has now moved to manage the Macarthur store. (I was eavesdropping). So the doors shut, people left, staff did their shopping and we helped pack up the books. We met the guys later in the bar. I was numb from the waist down after being on my feet all day. So we didn’t stay long. The bar was small. There weren’t any seats and we had to drive back to Canberra. So we said our goodbyes and went on our way. The next day we were at Conflux 7. Here I was not quite normal because I was very tired. I made a few panels but went home early. I was much better on Monday. That was good because we launched the Conflux Natcon for 2013 and sold memberships. Rock on! I looked up the price of the Chaos Reaver Titan and it’s 415 GPDs. That is unassembled. So I would have to pay someone to assemble and paint it for me. So it would cost me the equivalent of an Ipad. Now I understand why I didn’t get one for my birthday. Lol. I’ll have to wait til I’m a million selling author. I did think it would go well with my dalek on the shelf.